Defender Matty Pearson is confident he can become something of a regular on the scoresheet for the Hatters this season after netting his first goal during the 1-1 draw with Sunderland on Saturday. The 26-year-old centre half had scored nine goals while at Accrington during the 2016-17 season, although failed to notch during a stint at Barnsley last season. Pearson had already gone close before his second half equaliser and he feels he will improve Luton’s threats this term, saying: “I fancy myself every time I go up. “I’m pretty confident whoever I’m playing against, I feel I can get my head on the ball or get a touch. I’m a pretty disappointed I didn’t score with that header, but you can’t have them all. “I’ve always seemed to find myself when I’ve gone up for corners in the right positions. “I’ve always had a chances, hopefully I have a few more chances and get a few more. “It’s good to have players like Pottsy (Dan Potts), who can push you as well. 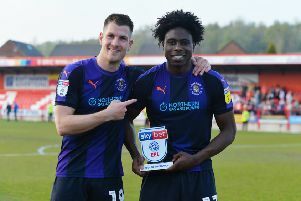 The defender’s last goal came coincidentally against Luton when the Hatters won 4-1 at Accrington back in April 2017. That time it was a close range header, whereas on this occasion, Pearson showed real class to bend a shot in with the outside of his right foot after a clever short corner routine. He said: “It just fell to me, normally I score with my head, so I’m just happy I’m off the mark. “We go through corners like every team and luckily this one paid off. “The way it fell was perfect to get a strike at goal and thankfully it went in. I was just happy I could get the team level and try and push for the winner. “There were a lot of bodies there, I was a bit lucky how it fell to me, but you’ve got to be there, got to be in and amongst it to get the chances and it was just perfect really. It certainly impressed Town defeat Jack Stacey too, as he said: “I think when he was at Accrington, he did score quite a few goals, but I doubt he scored many curling them with the outside of his right foot. Despite earning Town their first point of the League One campaign, Pearson wasn’t celebrating too much, frustrated by the manner in which he was beaten by Josh Maja’s run for the Black Cats opener. He said: “I was disappointed with their goal personally. “It was a good move and the higher up you go that’s the sort of movement they’re going to have. “It was a good pass and a good goal, but as a defender you always look for little bits.